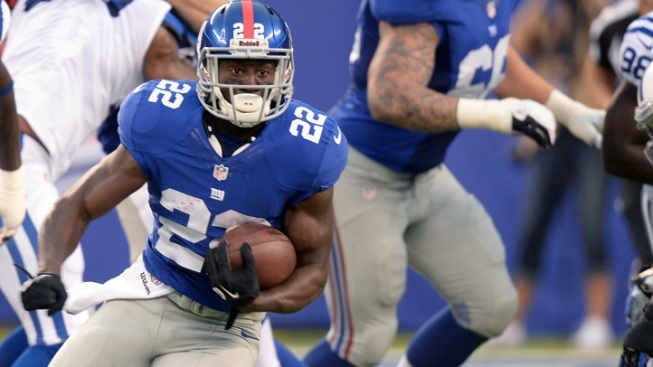 David Wilson could have a big day against a Cowboys defense coping with injuries. The Giants’ running game took a hit with the loss of Andre Brown to a broken leg that will keep him out for at least the club’s first eight games. With the club’s depth thinned behind starting tailback David Wilson, some might suggest it would be prudent for the Giants to lean on their passing game in the Sunday-night opener at Dallas. At times, that could be a sound strategy. The Giants’ passing game can give any defense trouble, and Dallas has some questions at safety. There will be opportunities for quarterback Eli Manning and a deep, talented pass-catching corps to strike. However, the Giants’ running game also has a real opportunity to begin the 2013 campaign on the right foot. The Cowboys’ defensive line is already down one starter, as defensive tackle Jay Ratliff (groin) will begin the campaign on the physically-unable-to-perform list. Also, starting left defensive end Anthony Spencer (knee) could also miss the game. The Cowboys’ defensive line depth could be a season-long concern. The club traded for Colts lineman Caesar Rayford after final cuts to bolster in the front four, but Dallas was never especially deep upfront even before the injuries to Ratliff and Spencer. Also, key reserve end Tyrone Crawford suffered a season-ending Achilles injury in July. The speedy Wilson figures to get the bulk of the carries against the Cowboys. Few backs are more capable of making an NFL defense pay dearly for mistakes in the run game. Surely Dallas is going to school on being sound in its concepts and sure in its tackling. Third-year pro Da’Rel Scott could spell Wilson on occasion. Scott has just 11 regular-season carries to his credit, and it’s hard to see him playing a major role in the offense unless pressed into service. Nevertheless, he needs to make the most of the work he gets as the Giants try to chip away at the Cowboys’ resistance. The Giants aren’t built to be a ground-and-pound club, but some persistence in the running game would make a lot of sense on Sunday night. The more stress New York can put on Dallas’ front four, the better, and the pay-off could be Wilson getting the small crease he needs to put a big hurt on the defense.